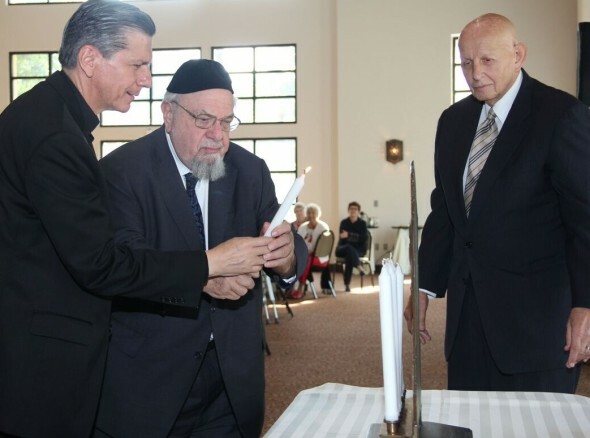 Archbishop Gustavo Garcia-Siller (left) and Rabbi Aryeh Scheinberg light candles on the Menorah, as Rabbi Sam Stahl observes, at the interfaith celebration. Calling the Second Vatican Council a “miracle” which changed Catholic Jewish relations forever, Rabbi Jack Bemporad addressed San Antonio’s annual Catholic-Jewish Chanukah celebration, speaking of its impact to date and pointing out what still remains to be done. The luncheon festivity was held at the San Fernando Cathedral Hall to a capacity audience of more than 325. The rabbi observed that it was appropriate to celebrate the document’s 50th anniversary during Hanukkah, a season celebrating miracles. The miracle of Nostra Aetate (In Our Age) was that it recognized God’s covenant with the Jews as being eternal and not having been superseded by Christianity. It stated that Judaism was still a live and vital religion. Bemporad has concluded that one must be true to one’s own faith. Many years ago, he pointed out, interfaith discussions often amounted to “Look, let’s all agree,” and didn’t really face the issues that separated Christians and Jews. It’s important that each side in a dialogue say, “This is who we are and this is what we believe,” he asserted. However, he emphasized, “That doesn’t mean that, by affirming what we believe, we in any way want to denigrate the other. That’s a very important point; when I represent the other, the other has to be able say, ‘That’s an accurate representation of my religion.’ When you represent me, you recognize me, and you do it in a way so that I can say, ‘That is accurate.’ It answers the question, ‘With what eyes do you see me?’ Until I know with what eyes you see me, it’s going to be very difficult to have really genuine dialogue,” Bemporad said. Bemporad recalled for the audience what he remembers as his “great good fortune,” being present at an audience with Pope John XXIII at the Vatican in January 1960. He admits, however, that initially, he was very skeptical, given the Church’s earlier treatments of Jews. I grew up in an Orthodox home and was forced to leave Italy with my family in 1938 because of the [fascist] racial laws; that’s not a small matter; let’s be clear. Later, when I went to Hebrew Union College, I was a research assistant for Ellis Rivkin,” Bemporad recalled, referring to a distinguished professor of history at the college. “He had me looking up all these references from the Middle Ages and all the difficulties the Jewish community had, especially in Christian Europe. So I went to that papal audience with a chip on my shoulder. I wasn’t so happy to meet the pope. We Jewish people have suffered at the hands of Christians,” he noted. Continuing, Rabbi Bemporad said, “The thing that was great about John XXIII is that as a papal diplomat in Turkey and Greece during much of World War II, he issued thousands of [forged] baptismal certificates to Jews fleeing various countries of Nazi-occupied Europe. When the French Jewish historian Jules Isaac met with Pope John XXIII in June 1960, the rabbi continued, “the first thing Isaac said was, ‘The Christians have separated Jesus from Judaism; how can you separate Jesus from Judaism?’ He pointed out that Paul himself said that “the Jews are the most dear to God because God’s promises to the Jews were irrevocable” – which later was incorporated into Church teaching at Vatican II. “Isaac said, ‘Why would you want to treat us with contempt?’ John XXIII immediately called for Augustin Cardinal Bea,” referring to the new president of the Pontifical Council for Promoting Christian Unity. “When Isaac left, he said, ‘I have found someone who understands our plight.’ Cardinal Bea told Isaac, ‘… the pope told you that you have more than hope to expect, because something will take place.’ ” This meeting led to the whole program of Vatican II (regarding the Church’s relations with the Jews), Bemporad explained. “What did Vatican II do? First, it called for the re-examination of the relationship between the Church and Judaism and the Jewish people; (the Church) went from a theology of a dead, outdated and superseded Judaism to a theology of a living Judaism. Second, it rejected the idea that all forms of anti-Semitism and anti-Judaism could in any way be found in Christian or scriptural teaching; but most important, the Church determined that God’s covenant with the Jews is irrevocable – and therefore, it’s not that the Jews were the people of God but the Jews are the people of God.” This, Bemporad said, was a tremendous transformation. Bemporad quoted Pope John Paul II, whom Bemporad characterizes as “one of the greatest men of all time,” as saying that the declaration Nostra Aetate “remains for us – for the Catholic Church, for the episcopate (bishops) and for the pope – a teaching which must be followed – a teaching which it is necessary to accept, not merely as something fitting but much more, as an expression of the faith, as an inspiration of the Holy Spirit, (and) as a word of Divine wisdom”. Pope John Paul II, who was officially recognized as a saint in 2014, along with Pope John XXIII, “took all those things that Vatican II had done and decided that he was going to go to the synagogue of Rabbi Elio Toaff, the Chief Rabbi of Rome,” Bemporad said. Pope John Paul II did so much to improve the Church’s relationship with Jews, Bemporad observed. “Not only was he the first pope to visit a synagogue, to summarize the totality of the teaching and the condemnation of anti-Semitism, but he was the one who insisted that these teachings not be left in some library, but that they must be available to everyone,” he recalled. Once, while lecturing in Croatia, Bemporad said he received a book in Croatian as a gift: it was the new Catechism of the Catholic Church. The gift came from the president of the local Jewish community, who said, “This gives me hope.” Why? “Because it says that you don’t have to be Catholic to be saved; there is salvation outside the Church; what you have to do is live a moral life in good faith, and you’ll be saved. That’s exactly what the Tosefta, an ancient Jewish text, said: that the righteous of all nations have a place in the world to come,” he added. Bemporad summarized his points by declaring that the Catholic Church, “in statement after statement and in meeting after meeting, has done everything it could to re-represent the Jews and to give them a proper place,” to say they are a vital, living religion” and that not only can the two communicate together but can learn something from each other. Bemporad also referred to a document The Jewish People and their Scriptures in the Christian Bible, noting that then-Cardinal Ratzinger (later Pope Benedict XVI) made three points in its introduction: First, that without the Hebrew Bible, the New Testament would be inscrutable …There’s just so much in it [The New Testament] that absorbs and reaffirms from the Hebrew Bible. Second, the Jews help Christians by anticipating the coming of their Messiah; they help Christians to anticipate the Second Coming. Third and most important, Jewish interpretations of Scripture and their texts not only are authentic and valid, but they have every right to interpret the Bible in ways that are different from the ways Christians interpret the Bible, and it’s still valid. “That’s amazing,” Bemporad pointed out, “because it’s no longer true that somehow, the Hebrew Bible and Jewish teaching is exhausted in Jesus as the Christ; that’s finished.” Cardinal Kurt Koch, the current president of the Pontifical Council for Promoting Christian Unity, speaking last June at the Gregorian in Rome, made what Bemporad called “a magnificent statement” amplifying this point, explaining the importance for priests and laity to learn what rabbinical interpretations are. “The most interesting and important thing is that Pope John Paul II believed that none of this would work until full diplomatic relations existed between Israel and the Holy See, so he asked Cardinal Edward Cassidy to look into the matter. As a result, The Holy See and Israel opened full diplomatic relations in December 1993. Finally, Rabbi Bemporad recalled a meeting with Pope John Paul II in Denver in 1993 during World Youth Day. “He had a small group of us there, and he said, ‘We may not be able to agree theologically, nor is it essential that we agree theologically; but what we have to do is unite on an objective and universal ethic for the world. The rabbi briefly praised San Antonio’s long, rich history of interfaith friendship, which predates the Second Vatican Council by many decades. For example, three giants in interfaith leadership there were Rabbi David Jacobson of Temple Beth-El, Catholic Archbishop Robert E. Lucey, and Episcopal Bishop Everett H. Jones, who became close friends in the early 1940s, invited each other into their homes for supper and addressed each other’s congregations. They often addressed the whole San Antonio community jointly, giving moral guidance on many social issues that affected the whole community. Bemporad hailed San Antonio’s history of interreligious dialogue, understanding, and mutuality, noting that the large turnout for the Hanukkah service showed the mutual love and affection between the two communities and was a model for all cities everywhere.